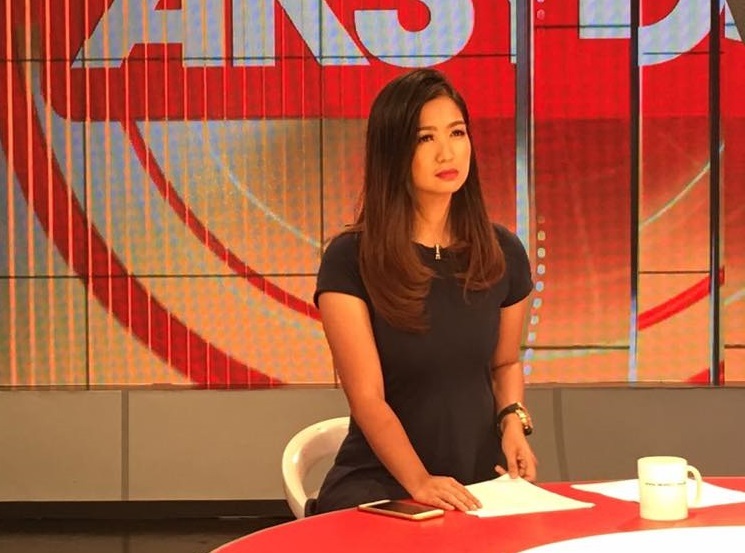 Carla Lim, one of the top news reporters of TV5, has left the network. "Mula Novaliches hanggang sa Morse code building sa Reliance at sa bagong building na matatapos na, thank you Kapatid!" she posted on her Facebook account Wednesday, along with photos her home network studios. "Thank you for the opportunities, heartbreaks, challenges, trust, conflicts, politics, camaraderie, compliments and criticisms." She added: "I never regretted anything. My heart is full of gratitude. This was my home for the past 6 years. You built my character. I did see people come and go but fact remains that I established great friendship inside this station. In my heart, you will still be the fastest growing network." Lim joined the Kapatid Network in 2010 after a short stint at GMA-7, where she served as a program researcher for the venerable Reporter's Notebook. She began her television career at UNTV — where she was then known as Carls Teng — as a segment host, weather girl and health news segment anchor for the morning show Good Morning Kuya. She would later on join the network's reportorial team, covering entertainment and general assignment, later on the lower house and the Senate. She would eventually become a diplomatic reporter, which has been her beat since then, making her adept at reporting issues concerning our foreign affairs. Just this year, Lim was personally handpicked by the U.S. embassy as the only Filipino journalist to cover the Young Southeast Asian Leaders Initiative (YSEALI) program in Laos, where outgoing U.S. President Barack Obama made an appearance. Ending her note, Lim said: "I wish you all the best in bringing smiles to the Filipino people here and abroad. No matter how hard it'll be, remember and assess the station's core value and agenda — 'happiness' and give this to the public. From a Kapatid, soar high TV5... higher than you thought you will be. There so much in you. More than meets the eye. Thank you for giving Jhemmylrut 'Carls' Teng a chance and became Carla Lim. 😘 This time, Carls Teng has to get back and prove herself on a new journey she chose to be in. No goodbyes, just new beginnings..."